Summary: God's Gift is a very potent medicine and is very easy to over-medicate with, so be ready to feel its pain relieving effects for well over 2 hours. God's Gift is sure to please your taste buds! 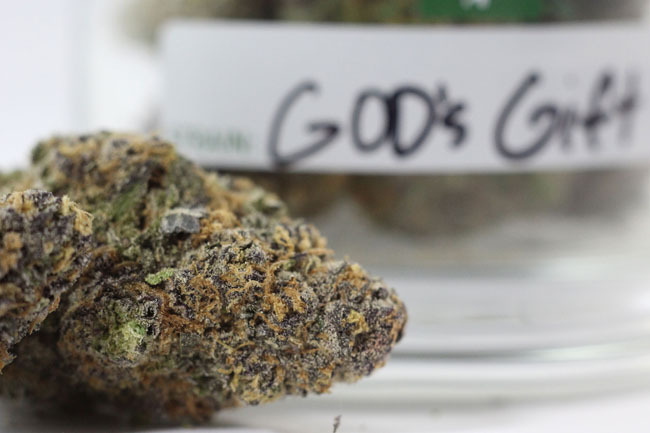 God’s Gift is a very unique strain of medical marijuana. It is an essential strain for the typical medical marijuana strain junkie to try. It has a beautiful dark purple to dark green color, and its trichromes glisten in the light. The buds are compact and meaty. This strain has a very unique floral scent, and it is very pleasing to the taste. God’s Gift is a potent indica-dominant strain. Its genetics are superior, as it is a descendant of Grand Daddy Purple and OG Kush. God’s Gift is a very potent medicine and helps tremendously with pain. It is very easy to over-medicate with God’s Gift, so be ready to feel its effects for well over 2 hours. God’s Gift is a good strain to soothe the effects of depression and stress. Overall, God’s Gift is a very good strain of medical marijuana. It receives a 5/5 star rating. Looks like: Dark green and dark purple with orange hairs. Smells like: Pungent floral scent. Makes you feel: Happy, relaxed, and content. Helps you with: Depression, stress, and pain. Eleanor Russell+ Based in San Francisco, Eleanor specializes in reviewing strains of cannabis flower and concentrates, and the dispensaries that sell them. The high from God’s Gift lasts foreverrrrrrr. I’ve only smoked God’s Gift once, but it was enough for me to declare it as my favorite! This strain didnt really do much for me.. A pretty good strain, just nothing special. Never seen such nice weed. God’s Gift is some amazing weed! Kinda smells like a grandma… but hits like a 300 pound linebacker.